Four episodes in, and we’re reaching a point in Westworld where I’d believe that almost anyone was secretly an android. But, last night, there was finally a hint at an answer to one of the show’s biggest mysteries: Who is the Man in Black in the real world? 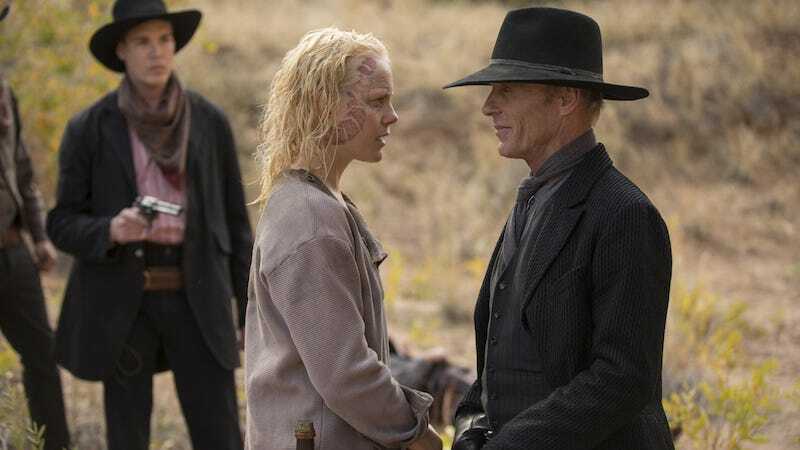 Trying to “figure out” Westworld is kind of pointless. It’s not that kind of show. All the puzzle pieces are deliberately presented to us in a jumbled up form and there’s no promising that anything we’re seeing actually happened in the order that we’re seeing it. And we have no guarantees that, say, the things happening with the engineers are actually happening simultaneously to what we’re seeing in the park. You just have to let the show go where it’s going to go and enjoy the ride as it does. Otherwise, you’re going to go fully and incredibly insane. As I have over a couple of nagging questions. Like, for example, whether or not Robert Ford’s grand story, the one he’s currently executing, is also the maze that the Man in Black is hunting. Ford says he’s been working on this big thing for decades, and the Man in Black has been coming to the park for about that long. He’s the game player most equipped to deal with whatever Ford’s got planned. So I’m pretty sure it is, but also not sure when any of the clues the Man in Black is finding were put in. Incidentally, for all the violence in this show, nothing has been more terrifying than Ford’s lunch with the normally dominating Westworld operations manager Theresa Cullen. He brought her to a place that he knew she had gone to as a child, with his giant machine rig digging up earth in the background, demonstrated his power over the hosts (which he commands like an army), and basically tells her to get out of his way. He also hints that the every time the business interests had interfered with his plans, things have gone badly and they’ve ultimately let him have his way. Anthony Hopkins never stops being full of genteel menace and now I’m obsessed with the history of this park, which is increasingly looking like a series of managed disasters. Another full-blown paranoia Westworld invites you to join in on is trying to figure out if any of the “human” characters they’ve introduced are actually hosts. They set us up for that in the premiere, putting Teddy on the train with the guests and then revealing that he was all part of the game. Of course, that was all still the park. Last week, the show made a pretty good attempt to convince us that Bernard was an android. Hell, I was pretty sure Ford made him into an android version of the co-creator Arnold, since Arnold’s tragic personal life and Bernard’s son’s death were referenced as parallels (in another one of Hopkins’ “banked creepiness” speeches). Plus, Ford has proven that he’ll rebuild his past with androids with the slightest provocation. He built himself as a child! He’d totally create another Arnold and watch him nearly destroy all the androids again by implanting them with full-on crazy programming. Bernard talking to Delores about the maze added fuel to that fire. I cannot tell if the maze is one of the things triggering the androids to remember past lives or just part of Ford’s grand plan or if Ford’s grand plan is just to have the androids fully aware because he is that into playing god or what. I do know that Westworld makes everything a possibility. Another person that I would fully believe is an android? Stubbs, the security head, who has reactions to everything that are just enough to be ironic if it turned out he was an android, too. What we do know is that the Man in Black’s quest is happening at roughly the same time as Billy’s (Jimmi Simpson), so they’re not the same person. We can also sort of discount the theory that he’s Arnold, since his charitable work with people runs counter to Ford’s description of the man. Actually, his casual killing of the androids also runs counter to Ford’s description that Arnold preferred hosts to humans, so who knows? The thing is that the writers love playing with our expectations of the Man in Black. They showed us the rows of white and black hats in episode two to remind us that the park runs on the iconography of westerns, so the Man in Black’s whole outfit screams “bad guy.” But the words of the guest say that he’s a good guy outside the park. The Man in Black’s outfit also, for those of us who’ve seen the original movie, scream “android.” He’s very much in the mold of the Gunslinger who, all in black, goes around killing the humans. The Man in Black’s role is all about asking us what matters in a person. All we—and the hosts—see of him is, basically, terrible. Especially since the hosts are presented to us as real and the treatment of them as objects makes us uncomfortable. Of course, to him, it’s all a game and he’s playing it better than anyone else. It’s not real. And if he’s awful in the game, does it matter? He’s saving “real” lives on the outside, after all. Which one is the real him? Westworld isn’t going to give us any answers to that, of course. The show’s about forcing your mind into pretzels pondering these questions, not performing a morality play. It’s Maeve, with her acceptance that reality isn’t what she thinks it is and her gleeful embrace of being shot to death, that is the real audience analogue.